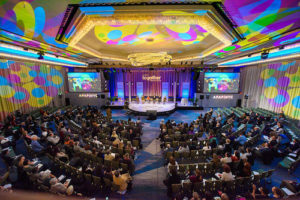 Enjoy a unique experience in New York City with our own Jonathan Winkle at the Annual APAP (Association of Performing Arts Professionals) Conference. The world’s largest networking forum and marketplace for performing arts professionals will take place in NYC the weekend of January 12-14, 2018. Performing artists from over 30 countries convene in NYC to set the tone for the year through a myriad of showcase performances. Be at the center of it all as Jonathan escorts you to hand-picked showcase performances where you’ll be the first to view a large roster of acts being considered for booking by PSF for the coming seasons. Enjoy a wide variety of performances by artists showing off their very best. 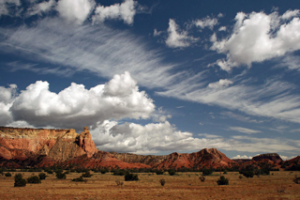 This unique day-into-night experience for 10 people focuses on the iconic American artist Georgia O’Keeffe and her New Mexico. This is a special opportunity to spend the afternoon with Cody Hartley, Senior Director Collections & Interpretation at the Georgia O’Keeffe Museum. 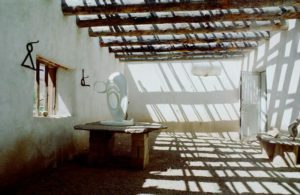 Cody will take 10 lucky individuals on a private tour of Georgia O’Keeffe’s home and studio in Abiquiu. Transportation is included. Value: OMG! What beautiful dancers! A memorable night out at the Ballet! Be up front at one of Performance Santa Fe’s most anticipated annual events: a visit from venerated American dancer Daniel Ulbricht and the Stars of American Ballet. After enjoying an electrifying dance performance, you and your guests will have a private opportunity to meet the dancers and talk with them at a reception. • 10 front row seats to your choice of one of two performances at the Lensic. Value: Your lucky guests will love you forever! As a MacArthur Fellow, multiple Grammy-Award winner, and Downbeat Magazine’s International Critic’s Poll winner, Maria Schneider is a composer and conductor of music that is beyond categorization. Tailoring her compositions to distinctly highlight the uniquely creative voices of her 18-member collective that is made up of some of the finest musician’s in jazz today, Schneider writes big band compositions with the color of a classical orchestra. • 10 front row seats to the Maria Schneider Orchestra concert on Friday, March 2, 2018 at the Lensic. This piece will be revealed the night of the Gala! Tony Abeyta is a Navajo contemporary artist working in mixed media painting. He was the 2012 recipient of the New Mexico Governor’s Excellence in the Arts Award, and recognized as a Native Treasure by the Museum of Indian Arts and Culture. 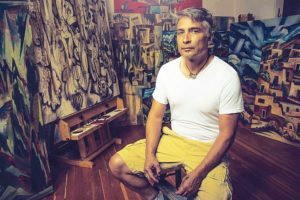 His work can be seen at the Blue Rain Gallery in Santa Fe, and is included in the Smithsonian’s National Museum of the American Indian, Boston Fine Arts Museum, the Heard Museum in Phoenix, New Mexico Fine Arts Museum, the Autry Museum in Los Angeles, and the Eiteljorg Museum in Indianapolis, as well as in many other private and public collections. 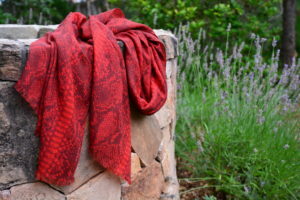 This luxurious scarf is by the renowned Swiss fashion house Akris which specializes in luxury goods for women. It is of exceptionally fine wool typical of the custom-produced fabrics favored by this third generation design firm. In sophisticated shades of deep red this is a versatile piece of the utmost quality and style. Its approximate size is 36” by 72”. What a gift this would make – for yourself or a loved one. 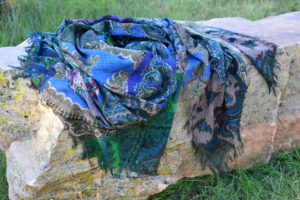 This beautiful jewel-toned scarf by luxury fabric accessories brand Franco Ferrari of Milan is made of a fine merino wool. 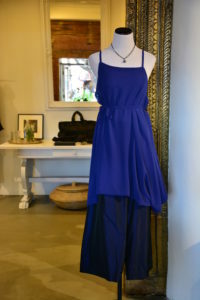 With generous proportions of 48” by 60” this piece can be worn in a variety of ways. The rich colors of the Italian fabric and the high style of the design show why Franco Ferrari is a leader in fabric accessories. And we think the colors reflect our Peacock theme beautifully! This stunning handbag by the Italian brand Henry Beguelin is a unique piece crafted by hand with ancient mastery. It is a timeless piece which will always be current because it is a true expression of the brand’s low-key elegance. 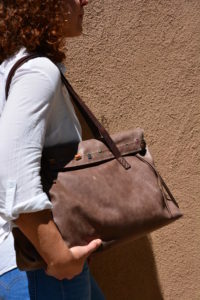 The special vegetable tanned leather used in this bag and the addition of beads and thread-work are hallmarks of the brand. This quality bag will be with you forever. 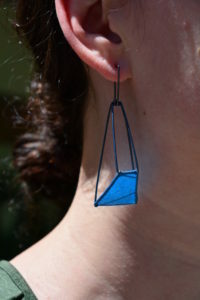 In oxidized silver wire and a gorgeous blue paper these truly reflect the artist’s desire to make visible interactions between structure and movement. They are “performative sculptures for one’s ears.”  The paper is handmade using Philippine plant fibers and treated to protect from water and abrasion. These stunning earrings are unique and make an artistic statement. 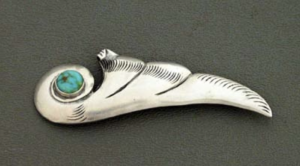 This vintage Navajo silver pin is set with a single round cabochon of natural native turquoise. Its overall shape is of a wave, inspired by a bird’s wing with swooping feathers. It measures approximately 1” by 3 1/2”  and has chiseled stamping at its ends. This is a quality vintage piece authenticated by the specialists at Shiprock. The name Tourmaline comes from the Sri Lankan words “tura mali” which translate to stone with mixed colors, certainly referring to the breathtaking color spectrum of this gemstone. 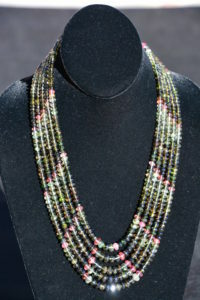 This vintage five strand necklace showcases the beauty of this stone in its shades of red, green, yellow and blue. The stones are artfully arranged to create bands of color along its 20” length. A stunning piece! These two pieces were made in Italy by a small label designer of 30 years experience. Her training as an architect is reflected in the composition of this tunic which is cleverly designed to be worn in a multitude of ways and can be dressed up or down. The cropped wide leg taffeta pants are in a color-saturated deep blue which gorgeously complement the cobalt blue of the tunic. These pieces are sized in a generous medium. A beautifully chic outfit which will certainly stand out from the crowd! This contemporary figurative sculpture in natural clay and acrylic is by Les Namingha who is descended from an illustrious line of Native artists. Great-grandson of legendary potter Nampeyo, he received his ceramic training at the side of his aunt, famed Hopi potter Dextra Quotskuyva Nampeyo. 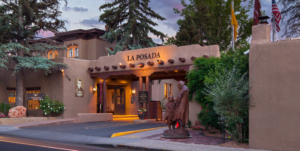 Les began participating in Santa Fe’s Indian Market in 1992 and has numerous awards including Best of Division in both traditional and non-traditional pottery and Best of Class in pottery. Though accomplished and confident in traditional ceramics, Les continues to challenge himself in new expressive directions. He plays with the nexus of traditional and modern, as displayed in this lovely sculpture. His work can be found in major museums across the country as well as in numerous publications. He is represented by Blue Rain Gallery in Santa Fe. This piece measures 14” high by 3” wide, and sits on a round wooden base. 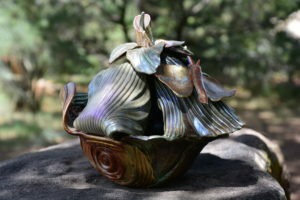 The hallmark of Jim Cohen’s work in clay is the natural ripples and draping that he achieves in his pieces. Their forms are so natural one almost expects to see the sculpture change shape as the clay continues to fall into place. Each of his pieces has incredible depth and “Moonlit Garden” is no exception. This intricately constructed lidded vase is of high-fired stoneware, glazed and with painted elements. Jim has worked in clay for 40 years, and has shown in Santa Fe and NYC galleries. His most recent exhibition was at Waxlander Gallery. The piece measures approximately 13” x 10” x 8” high. Array is a modern-day mercantile, offering an ever-changing collection of objects for the home and gifting. The owners, Tom Stark and Larry Redelin, with a distinctively crisp point of view, are always on the prowl for new treasures, so their assortment is in constant flux with fresh and interesting discoveries. 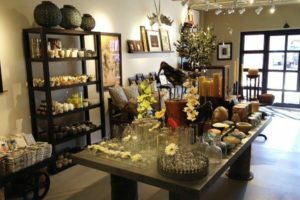 Their mission is to present a thoughtfully curated collection of objects that will captivate their customers and enrich their lives. 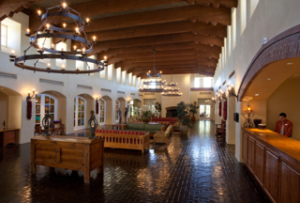 Each of the New Mexico hotels is custom-designed to tell a unique story centered around rich culture and heritage. 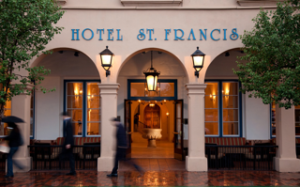 From the serenity of the simple monastic decor at Hotel St. Francis in Santa Fe to the contemporary Native American designs at Nativo Lodge in Albuquerque or the grand Spanish Colonial-themed Hotel Encanto de Las Cruces, the accommodations are sure to be accompanied by a real sense of awe. * Gift certificate accomodations are based on availability and a 21 day advance booking is required. Not available during holidays or major city events. Accomodations are based on standard room types, additional fees will apply for upgrades. 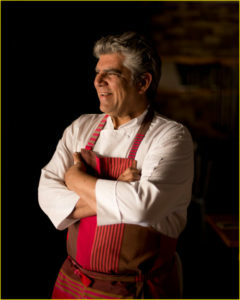 Dinner for 10 guests at La Boca personally cooked by eight-time James Beard Nominee, Chef James Campbell Caruso. Chef James will create a custom menu for you and your guests, paired with some of the finest imported wines and sherries from Spain. 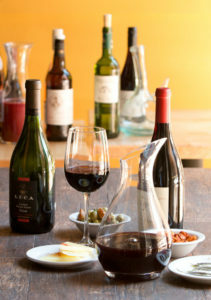 You and your guests will be able to enjoy an evening of unique and seasonal tapas made just for you. 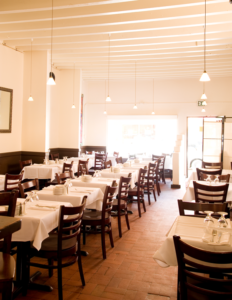 The Compound Restaurant has a heritage rich in history and regional influences. 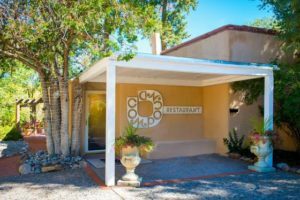 A recognized leader in Southwestern cuisine, Chef Mark Kiffin has chosen to create and focus his menu around the true regional ingredients brought to the Southwest United States by the Spaniards. The Compound has received many local and national accolades. 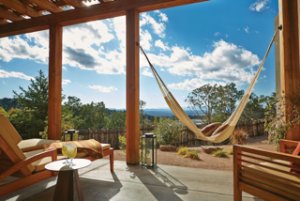 Two Night Stay in a King Casita and 50-Minute Spa Treatment for Two. 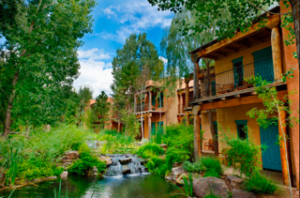 Located in one of the most romantic and adventurous locations, Four Seasons Resort Rancho Encantado offers a one-of-a-kind luxury getaway in the heart of New Mexico. The 65 room jewel box combines the service excellence of Four Seasons—a spa featuring regionally inspired treatments, a restaurant featuring local influences and ingredients, exclusive access to adventure and nature—with the intimacy of a boutique hotel. 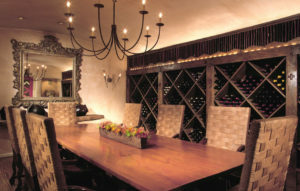 This package includes a two night stay in a king casita for two and two 50-minute spa treatments. This includes tax, however, excludes gratuities. Any charges incurred beyond the value of this certificate are the responsibility of the guest. With this dinner certificate in the amount of $225, you can book Table 21 (accommodates six to 10) and be seated at the large corner table in this exciting new restaurant. 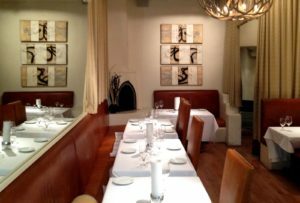 Paloma was opened recently on Guadalupe Street by well known Santa Fe chef Marja Martin. 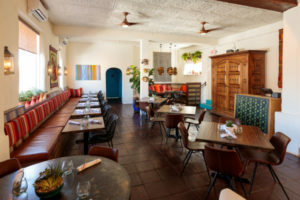 People are talking about Paloma: A Vibrant Mexican Kitchen & Bar. Try it!! !